The Temash River has been known to have the finest mangrove forest in Belize for a long while (Hartshorn et al. 1984) with very limited farming potential (King et al. 1986). The area was first proposed as a potential reserve with community interest in 1989 as part of a Biosphere Reserve which centered around Punta Gorda and included the Sapodilla cayes, Columbia Forest and the Temash River (Horwich 1989). At that time it was given support by the Ministry of Tourism and the environment, the Toledo Forestry Officer, a generalized meeting of Punta Gorda residents and similar meetings of Barranco and Crique Sarco Villages. Through lack of financial support, the Biosphere Reserve idea died. Since that time the Nature Conservancy adopted part of that proposal and incorporated the Sapodilla Cays into a proposal for the Port of Honduras. Under the National Parks Systems Act of 1981 the Government of Belize (GOB) created the Sarstoon-Temash National Park in May of 1994 to protect an area of 41,898 acres (Zisman 1996). In August of 1994, Judy Lumb visited the village of Barranco for the first time. She was asked to return to teach the women’s group to make quilts. The recently declared national park adjacent to the village was a subject for discussion around the quilt frame during classes the next year. In 1996 the women of Barranco again asked for help from Judy Lumb, this time to develop a proposal for the co-management of the Sarstoon-Temash National Park. This park provides a unique opportunity for inter-ethnic co-management because it is surrounded by five communities, Barranco, a Garifuna village; four Kekchi villages, Midway, Conejo, Sundaywood, and Crique Sarco; and a small settlement at the mouth of the Temash River called Temash Bar. It was suggested that a workshop be held to discuss the co-management of the park by the GOB and the 6 villages surrounding the park. The workshop planning was coordinated by Judy Lumb and Rob Horwich, along with Rafael Manzanero of the Conservation Division, GOB. The workshop was preceded by a number of visits to the villages by Judy Lumb, Rafael Manzanero, Rob Horwich, James Beveridge, and Steve Peterson. Since many of the villagers did not know of the park nor what a National Park involved, these preliminary meetings were geared to explain the situation and to encourage village leaders to come to the workshop which was held in Barranco on Feb 22, 1997. Preparations for the workshop were inadvertently aided by the fact that a earlier workshop was carried out in Belize City on Co-Management which was hosted by the Kekchi Council of Belize and the Inuit Circumpolar Conference. The example they used of co-management in Belize was the Community Baboon Sanctuary. The all day Sarstoon-Temash National Park Stakeholder Work shop was attended by about 72 participants, including leaders from Barranco, Crique Sarco, Sunday Wood, Conejo, Midway and Temash Bar. Other participants included members of the Kekchi Council of Belize, the Alcaldes Association, the Belize Center of Environmental Studies, Protected Areas Conservation Trust (PACT), Hopkins Sandy Beach Women’s Cooperative, United Nations Development Project - Global Environmental Fund, Inuit Circumpolar Conference, Belize Coastal Zone Management, Belize National Association of Guides, Community Conservation Consultants, The Nature Conservancy , Indigenous Mapping Project, Forestry Department Conservation Division and the area Representative, Minister Joseph Cayetano. The workshop was facilitated by Sebastian and Fabian Cayetano, former residents of Barranco. A major presentation by Rafael Manzanero of the Conservation Division and short presentations by others comprised the morning session. Due to the variety of cultures involved, the workshop was conducted in English, Spanish and Kekchi. Lively discussions were held throughout the workshop as the villagers expressed their concerns. 1) Whether they were in favor of the park? 2) How they would be involved with the park? 3) Who would represent your community on the Steering Committee? Reports from the villages were presented to the meeting at large. The conclusion of the workshop was that, whereas the villagers had many concerns about the park and how they would relate to it, they did select representatives to the Steering Committee and agreed move the process forward. The next meeting of the Steering Committee was scheduled for March 20, 1997. This workshop was an historic occasion, the first time several communities of different ethnic groups had gathered to consider joint co-management of a protected area. The transcript, prepared from audio and video tapes of the workshop, documents the presentations, discussions, and expressed concerns of the villagers. While the entire workshop was conducted in English and Kekchi with some sections also in Spanish and Garifuna, only the English is presented here. The Sarstoon/Temash National Park, declared in 1994, is the southernmost protected area in Belize. The park is singular for its location, and is surrounded by several Maya Kekchi communities and Barranco, a prominent Garifuna village. With the commitment for furthering the development and good use of the protected area, the Forest Department, along with other organizations, has initiated a series of consultations. The consultation described in this document vividly narrates the great interest from the villagers to maintain this park in perpetuity. It also provides an insight into the past practices for the enactment of protected areas, and the enormous work yet left to cover. The result of the workshop described here was the formation of a Steering Committee with leaders representing all the surrounding communities. This initiative has been warmly welcomed by the Forest Department and it is our expectation that the committee will function cohesively for the betterment of all. It is also the desire of the Forest Department to promote a positive and stronger linkage with the communities around the National Park and for them to participate as active members in the process of managing the Sarstoon-Temash National Park. We welcome the concern, with hopes that the management of the park remains consistent with the protection and conservation of the natural resources, and that it also strengthens a better livelihood for the people found in this sector of the country. In Toledo we have a lot of indigenous organizations that are emerging, pursuing some level of control over their resources, over their economic base. The Kekchi Council has been exploring for some time now the concept of co-management. It is a very, very slow process. It takes a lot of education, not only from the indigenous people, but also creating a bridge between the technical people within government who are making the development plans for Toledo on behalf of the communities wherever that plan may be located. The gathering represented in this transcript presents a reality of indigenous people, indigenous communities coming together to formulate and voice their concerns so that whatever happens, the reality of the communities that border the Sarstoon-Temash National Park is reflected. 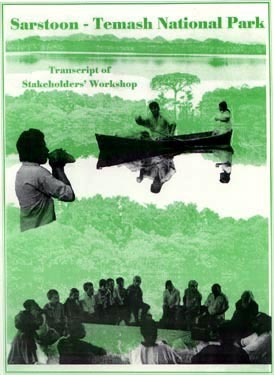 If properly formulated, co-management could benefit indigenous communities by incorporating their traditional ecological knowledge, their understanding of the environment, their environmental orientation, to become a part of the management of the Sarstoon-Temash National Park, to have some control over the resources in their area. It is only through their perspective, their environmental orientation, that management will provide the space for indigenous people to participate, not only to gain economic benefit from management of their resources, but to maintain the spiritual and cultural bond that they have had with their environment. The Sarstoon-Temash Steering Committee which was formed at this gathering has met several times and developed a major proposal to provide funds for our planned activities leading to co-management of the Sarstoon-Temash National Park by the communities that surround it. There is considerable interest in this project, the first of its kind, by several funding agencies. We hope that funds will be forthcoming in the near future.